Slot developer NetEnt have made a name for themselves over the years with some innovative and exciting slots. There have been the big budget tie-ins like Scarface, and the progressive jackpots of slots like Mega Fortune, but their innovative gameplay is another reason to hunt out some of their slots. 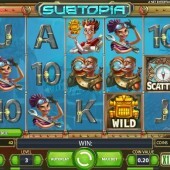 With a big jackpot of $50,000, a fun, underwater vibe, and a really neat twist on the multiplier feature, Net Ent's 5-reel, 20-payline online slot, Subtopia, looks like a worthy addition to the slots developer's arsenal. Drawing its inspiration from the underwater adventures of Captain Nemo, and any one of a host of aquatic literary heroes, the game sees us deep beneath the waves on the hunt for a priceless ancient gold mask. The bearded captain has a team of quirky accomplices, including a marine biologist, a brave diver, a feisty female mechanic, and a beautiful bookworm, as well as the requisite 10-through-Ace symbols filling out the reels. In the base game, there's also a sliding multiplier on the game screen - look for it in the bottom right corner - which offers you 1x, 2x, 3x or 5x your win when highlighted. The graphics are perfectly nice, although any serious animation is lacking, but the game is accompanied by some pleasant Hollywood action film music and some atmospheric underwater sound FX. So far, so Abyss - but what about the game's features? Well, the Wild is the golden mask, and substitutes for all symbols other than the compass and the Free Spins Multiplier symbol. The scatter, meanwhile, is the compass, and three or more triggers a basic free spins round. Here's where the neat touch comes in, in the form of the Captain's gear lever symbol. It acts as a random multiplier, giving you 2x, 4x or 6x on your winning combo at that time. Bonus multipliers aren't exclusive to Net Ent, of course, but if you're hot for this feature, be sure to look out for Gamesys's fun-filled slot, Double Bubble. 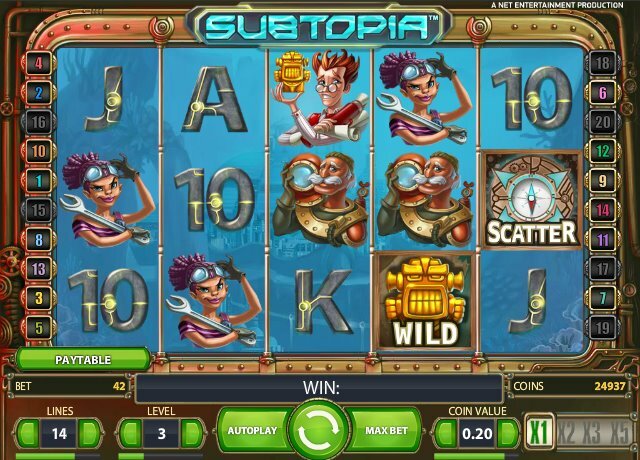 If underwater high jinx are your bag, though, you could do far worse than hunt out Sheriff Gaming's superlative 3D sea-epic slot, Atlantis: The Amazing Adventures of Pierre La Mer.